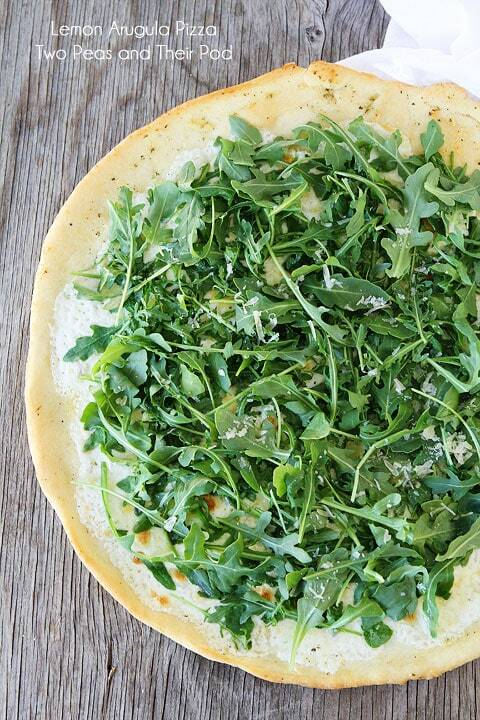 Thin crust pizza with fresh mozzarella, parmesan, arugula, and a splash of fresh lemon juice-who wants a slice? I am always looking for new pizza inspiration because Josh requests pizza for dinner almost every single day. I like pizza, but I need some variety in my life:) When I was in Austin this summer, I had the best arugula pizza. I couldn’t stop thinking about it so I made my own Lemon Arugula Pizza at home. It cured my pizza craving after one slice. Ok, maybe two slices. I had to eat more than one slice, the pizza was too good. I am lucky Josh loves eating and making pizza. He always makes the pizza dough. His first job was at Little Caesar’s, but I promise his pizza is WAY better:) I am glad he was young and didn’t take any pizza tips from them..ha! 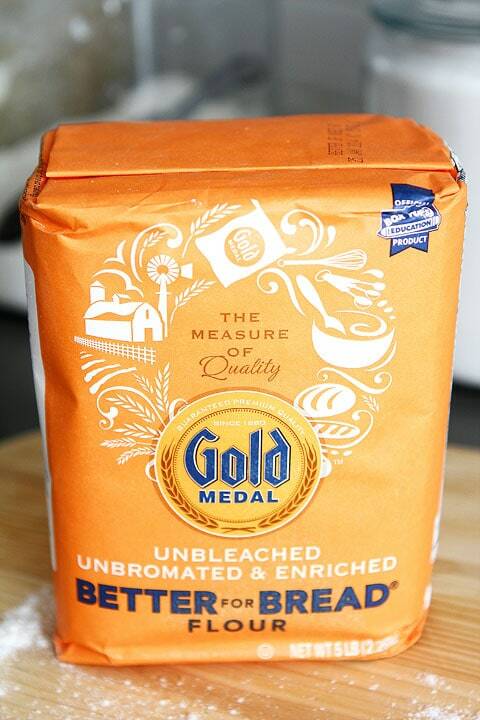 We always use Gold Medal’s Better For Bread Flour to make our pizza dough. It makes the best pizza crust! I wanted a thin crust pizza so Josh rolled it out thin and cooked it on our pizza crisper pan. You can make a thicker crust if you wish, just roll out the dough to your desired thickness. We topped the pizza with a drizzle of olive oil, fresh mozzarella cheese, and parmesan cheese. We baked the pizza until the cheese was melted and the crust was crisp! Josh pulled the pizza out of the oven and I topped it with arugula, fresh lemon juice, and freshly grated parmesan. Josh cut the pizza into slices and we had a family pizza party! I seriously love everything about this pizza. The flavors are fresh and simple. Josh wasn’t sure he would like a “salad” on his pizza, but he was pleasantly surprised by my Lemon Arugula Pizza. He loved it and so did Caleb! Caleb was shouting “pizza” and “bite” during our dinner. He couldn’t get enough! I am glad my boys enjoyed my pizza creation! 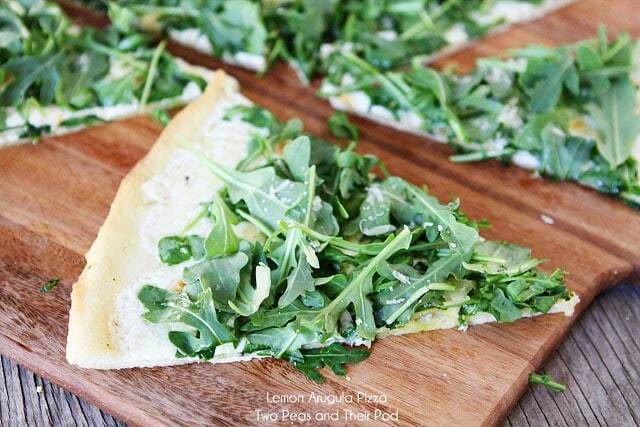 Make Lemon Arugula Pizza for your next pizza party! It was a hit at our house! 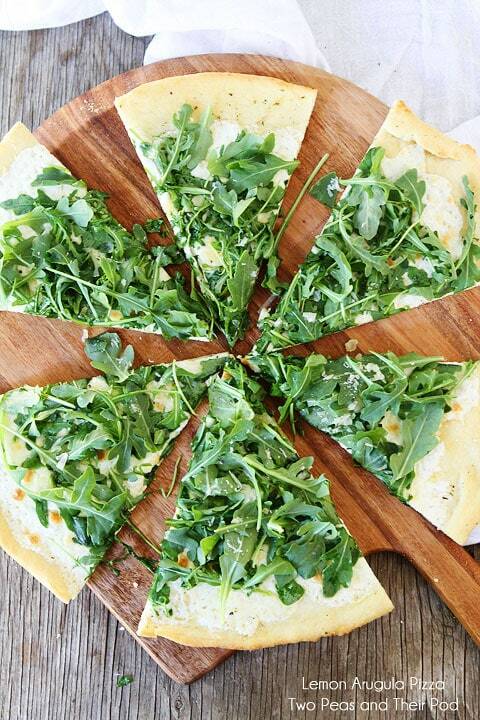 Pizza with fresh mozzarella, parmesan, arugula, and a splash of fresh lemon juice. This pizza is a great addition to any pizza party! 1. First, make the pizza dough. In a glass measuring cup or small bowl, combine yeast and 1 cup warm water. Add a pinch of sugar and let sit for 5 minutes. 2. In the bowl of a stand mixer, add the flour and salt. Mix the ingredients until combined. 3. Add the yeast mixture to the flour mixture. Next, add 1 tablespoon of olive oil. Mix until combined. Switch to the dough hook and knead for about 5 minutes on medium speed. 4. Spray a large bowl with cooking spray. Form dough into a ball and place in the bowl. Cover pizza dough with a damp towel and set in a warm area to rise. Let the dough rise for 1 hour or until dough has doubled in size. 5. Preheat the oven to 450 degrees F. Cut the dough in half. Take one piece of dough and punch it down on a lightly floured surface. You can refrigerate or freeze the other half of the dough or make 2 pizzas, if you wish. Using a rolling pin, roll the dough out into a circle. Place the pizza dough on a pizza pan or pizza stone. 6. Evenly brush the olive oil on the pizza. Top with fresh mozzarella slices. Add the parmesan cheese. Place the pizza in the oven and bake for 12-15 minutes or until pizza crust is golden and cheese is melted. 7. 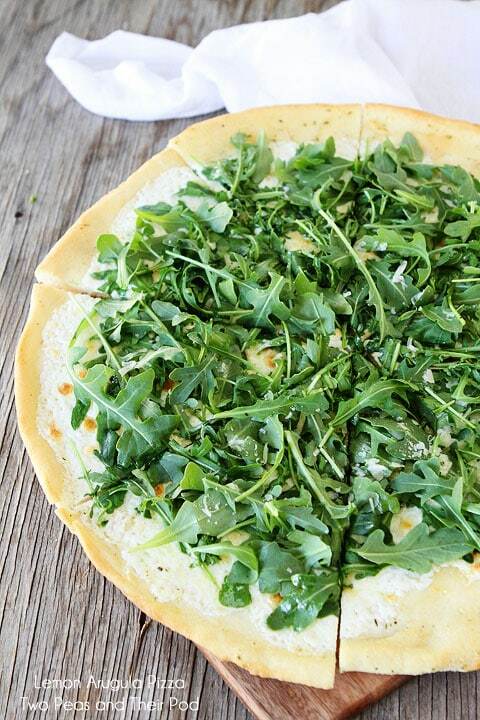 Remove the pizza from the oven and place arugula on top. Squeeze fresh lemon juice over the arugula and season with salt and black pepper, to taste. Garnish with additional parmesan cheese, if desired. Cut into slices and serve. Note-we made a thin crust pizza. Josh rolled the crust into about a 13-inch circle. If you want a thicker crust, don't roll it out as far. Disclosure: this post is in partnership with Gold Medal Flour, but our opinions are our own. I have been craving pizza and I am so loving yours. I love the thin crust and the lemon and arugula flavors. Nice combo! It just sounds amazing! Book marking this recipe!! OOH yum! This looks so fresh and summery! I love it. This looks deliciously light and fresh! That was a delicious pizza! A giant salad on a fab thin crust pizza–what could be better? SO light and delish! Dinner tonight for sure! First of all I have to say that I LOVE gold medal flour and think it is such a great brand. I buy their flour whenever possible. Second, oh my gosh this pizza is amazing and so pretty! 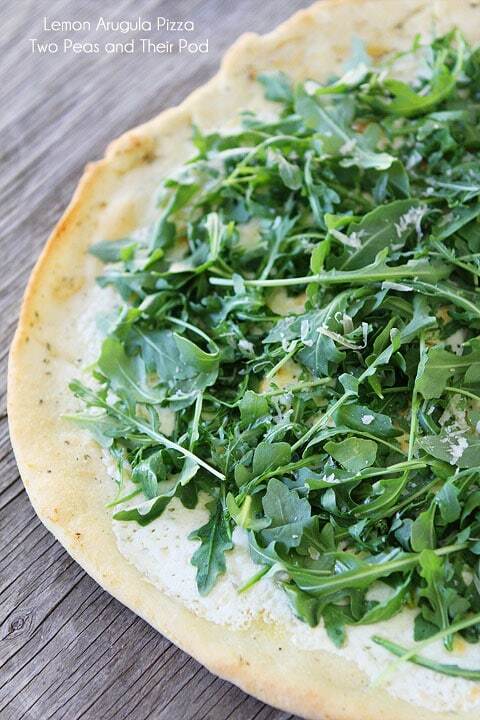 We love thin crust around here and all the pretty green arugula is calling my name! Such a great summer meal! I could eat this every day! This crust looks really good!! When you live in a town with 2,000 people there are so many things that you can’t buy here. Many that I have never tasted such as arugula. Never use anything but Gold Medal. See so many who use another brand but it is not available in my area at all. This looks perfect- I love lemon. I love arugula. I love pizza! I love arugula on my pizza! The lemon is a lovely touch! 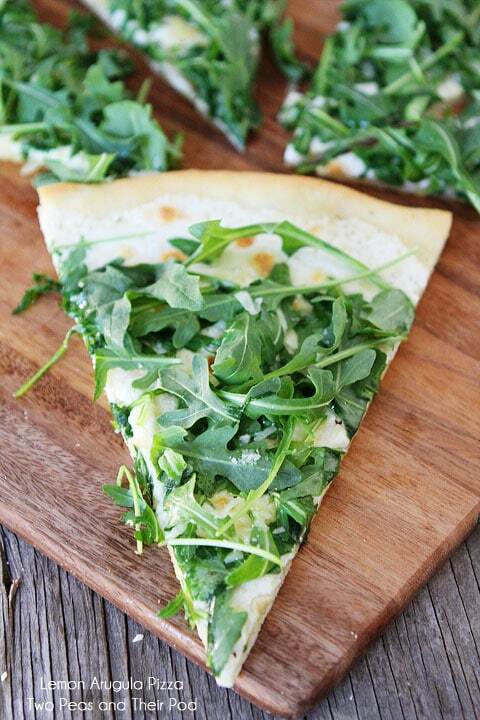 I love arugula on pizza!! Delicious! Such a fresh looking pizza!! I love a good homemade flatbread! gorgeous pizza, Maria!! I love the abundance of arugula on top!! 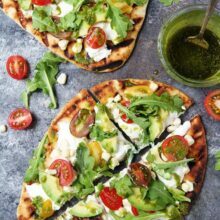 that flatbread is right up my alley – i don’t like pizza dough that’s super doughy or puffy. What a great vegetarian pizza! Peppery, lemony and totally perfect for a summer meal. What a gorgeous, vibrant pizza! That thin crust is looking amazing and I like the light summery topping! This looks really delicious! I’m going to try it with basil and onions. My husband, like yours, would be happy with pizza for dinner every night! This sounds great, I love the lemon and the arugula on top. I always use King Arthur for my pizza, I will have to look for this flour in my supermarket. I’d be yelling for more bites too, like Caleb!! That pizza sounds divine for summer! I long ago stopped using tomato sauce and the requisite sausage meats on pizza preferring fresher, often vegetarian ingredients. But lately pizzas like this have become a staple and we’re even grilling them on the BBQ. I liken them more to an upside down salad…and I’m good with that. Love these simple ingredients and I’m betting it was divine. I can never have too much arugula, looks great! 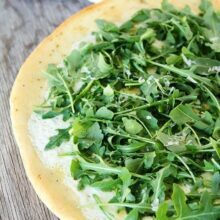 When I saw that you posted a Lemon Arugula Pizza, my first thought was oooooh I wonder if it’s like that one in Austin. That pizza was amazing! And this one looks like it would be just as delicious! 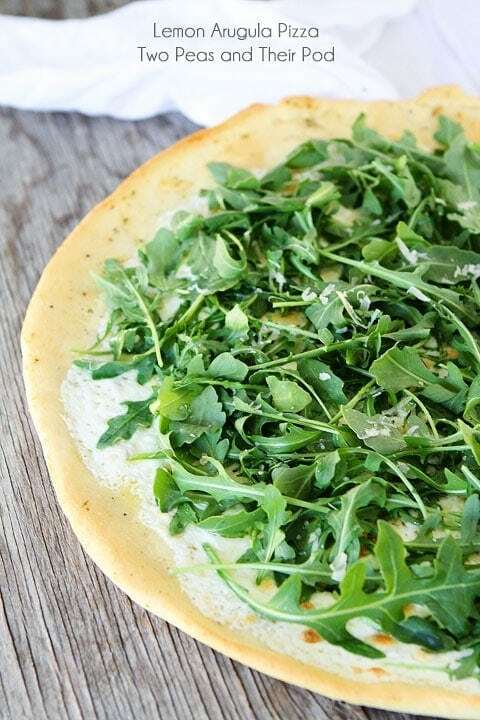 I would have never thought to combine lemon and arugula on pizza! Sounds amazing! I make this pizza all the time too! Delish!! 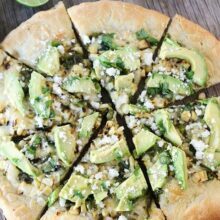 I kick it up a notch with garlic & chili infused olive oil and a slice of avocado on each slice with just a sprinkle of sea salt. I’m going to go make one now! This lemony cheesy topping sounds EXTRA tasty!! Love that thin crust and fresh summery toppings! My kind of pizza! Love it! Oooooh I want a slice! This looks so so sooooooo good! Wow, yum! I would definitely want a slice, this looks fantastic! What an interesting combination. Looks delicious! This looks awesome! I’ve recently come to love lemons on my pizza and I’ve allllways loved a little fresh arugula on my pizza. This will need to happen soon! This sounds like one I’ll definitely have to try. I always use my bread machine to help out w/ the dough, which is a combo of bread flour, and whole wheat pastry. I’ve made this several times since first pinning it and it’s delicious. 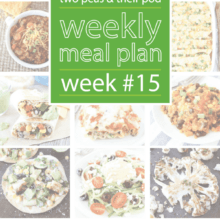 Easy to do and really light and brightly flavored. I heated some chopped garlic and a pinch of crushed red pepper in the olive oil before I brushed it on the crust. The only reason I didn’t eat the entire pizza myself was that I knew I would be happier if I got to eat it two days in a row. This was excellent! Very light and fresh. What a great addition to our list of favorite pizza toppings. I made this last night and it was delicious! Thank you!! Simple, elegant recipe! I love the taste of arugula! But SWAP out Gold Medal flour for an organic brand (Bob’s Red Mill Organic is great). Flour is one of the most sprayed crop with Round-Up and associated other herbicides that leaves residue in our food and bodies after eating. Go Organic to severely lessen chemical spray residue in your foods and to support the efforts of organic farmers who don’t use Round up and associated herbicides.